Uber Rewards has just been launched in nine cities in the United States, but the program will be rolling out to all riders in the country over the next few months. Uber promised to take into consideration all the feedback it receives and adjust the program to better suit its customers. The program will first be available in the following cities: Miami, New Jersey, Denver, Tampa, New York, Washington, DC, Philadelphia, Atlanta, and San Diego. However, even if you don't live in one of the cities covered by the service, you can join a waitlist to get a head start. For every eligible dollar that you spent on Uber and Uber Eats in the six months prior to joining Uber Rewards will be counted towards your membership level when the program goes live in your area. Speaking of membership levels, Uber Rewards customers can unlock four membership levels: Blue, Gold, Platinum, and Diamond. It's also important to mention that anyone can sign up to join at no additional cost. Uber Rewards members will earn one point for every eligible dollar spent on UberPool and Uber Eats orders, two points for UberX, UberXL, Select, and WAV, and three points for Black and Black SUV. Those who reach 500 points will advance from Blue to Gold, while at 2,500 points they'll gain Platinum membership. Finally, Uber Rewards members who reach 7,500 will advance to Diamond. Each type of membership has its benefits. 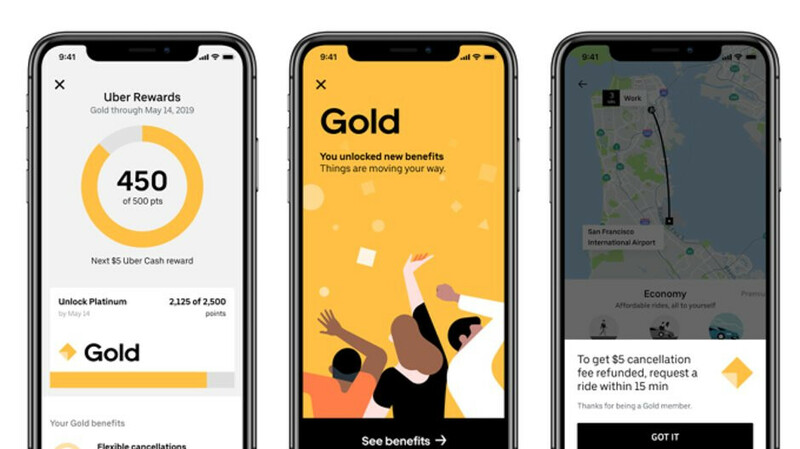 For example, Gold membership offers flexible cancellations, as well as priority support that should get them faster response times from support agents across Uber and Uber Eats. On the other hand, Platinum members get price protection on a route and priority pickups to reduce wait times at most airports, in addition to those two benefits that Gold members have. Diamond members will get premium support, dedicated phone support with 24/7 response times, complimentary surprise upgrades from UberX to premium products like Uber Black at no extra costs, and a special “UberX Diamond” option that will show up in the mobile app, which allows them to access high-rated drivers. Diamond members won't have to pay a delivery fee on three Uber Eats orders every six months.